Clinical research funded by the National Children’s Research Centre shows that 3D printed models of children’s hearts can help doctors plan complicated surgeries. They say that no two hearts are the same. For children with structural defects of the heart, and a history of multiple heart surgeries, this a serious issue faced by cardiologists. Now, for complex structural heart defects, doctors are turning to 3D printing to produce models to help them plan complicated surgeries. 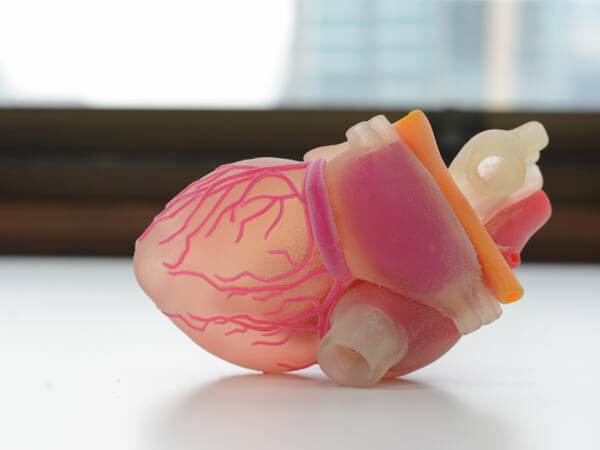 In an international study, Colin McMahon, a paediatric heart specialist based in Our Lady’s Children’s Hospital, Crumlin, used images taken during CT scans to create 3D printed models of the hearts of patients attending The Children’s Heart Centre. His aim was to determine if these models could assist in planning the surgeries of young children with heart defects that had undergone several previous heart surgeries. Three children aged between 4 and 11, all of whom had had their first heart surgery before their first birthday, took part in this study. By creating 3D printed models of their hearts, Professor McMahon and his team set out to determine whether 3D printed hearts could help ensure that they received the best treatment for their specific heart problem. Ultimately, and after careful consideration of the 3D model, and extensive discussion, it was decided that, for two of the children, it was simply too dangerous to perform further heart surgery. For these children, non-surgical management of their condition was agreed upon. For the third child, the 3D model allowed Professor McMahon and his team to plan a complicated, but ultimately successful operation. By using a 3D model of the patient’s heart, the surgeon can examine the very specific details of the defect. They can more clearly visualise, and even feel, how the various parts of the heart fit together. This allows them to make a better-informed decision about the best approach to surgery, and indeed decide if surgery is even the best course of action. For children in whom surgery is likely too dangerous, 3D printed models can be used to explain to their parents why surgery is not recommended, helping them to understand how this decision was reached. For the three children in this study, 3D printed models of their hearts changed their lives. For two, dangerous surgeries were avoided, while for the third, surgeons were able to plan the operation with greater confidence that it would be possible to safely carry out the procedure. With work ongoing to create more realistic models that can be actively used to practice operations, Professor McMahon believes that the use of 3D printed hearts is the future of heart surgery.